laserdisko 1 year, 7 months ago. Android Oreo 8.0 ROM, Moto G 4G LineageOS 15 has now arrived via a development build. If you want the OFFICIAL LineageOS update or some more Android Oreo ROMs then stay tuned to the Android Oreo LineageOS 15 ROMs page or the AOSP Android Oreo ROMs devices list page. 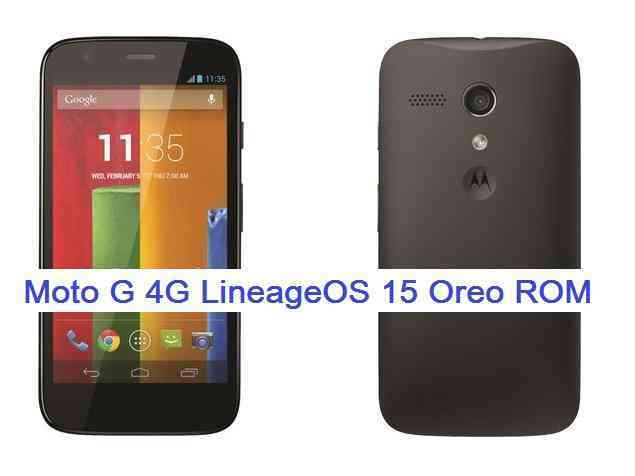 This LineageOS 15 for Moto G 4G is brought to you by CarlosArriagaCM. THIS IS AN INITIAL BUILD AND HAS MANY MORE BUGS. HAVE A BACKUP BEFORE FLASHING THIS AND TRY AT YOUR OWN RISK. Installing a custom ROM on a Moto G 4G (peregrine) requires the bootloader to be unlocked on the Moto G 4G (peregrine) phone, which may VOID your warranty and may delete all your data. Before proceeding further you may consider backup all data on the phone. You are the only person doing changes to your phone and I cannot be held responsible for the mistakes done by you. – Here is theTWRP update guide for the Moto G 4G. This TWRP recovery guide requires an unlocked bootloader on the Moto G 4G. Download and Copy the GApps and Moto G 4G LineageOS 15 ROM ZIP to your phone. First flash the Moto G 4G LineageOS 15 ROM ZIP from device. Then flash the GApps zip from your device memory. Reboot and Enjoy the Oreo 8.0 LineageOS 15 ROM for Moto G 4G. Copy the latest Moto G 4G Lineage 15 ROM ZIP file to your phone. Stay tuned or Subscribe to the Moto G 4G (peregrine) forum For other Android Oreo, Nougat ROMs, LineageOS 15 ROMs, other ROMs and all other device specific topics. en settings y en el acceso rápido de la barra de notificaciones y no funcionó. No encontré otros inconvenientes pero lo que miré funcionó perfecto, muy rápida y agradable la Rom. No rootee porque era lo siguiente a las pruebas de funcionalidad y paré ahí. Probada la versión del 20170906 con los mismos problemas y adicionalmente no funciona el wifi. Gracias. Trate de instalarla como dice la guía pero me apareció el error de twrp recovery: Process Ended with error 7, alguien sabe como lo soluciono? Installed the version of 20170914 in moto G XT1040. The camera does not work, flashlight, bluetooth (tries to connect but in the search of devices is put in permanent cycle of disconnection – connection) and the wifi is disconnected (connects a moment and falls, then reconnects and stays in cycle, Conection – disconnection). Linux appears as permissive, thanks for the effort to Carlos Arriaga and I expect another more stable version to test.